We upped the ante on goggles...Now we've set our sights on the sunglasses industry. Buying a cool set of shades, without having to mortgage your house was never easy. But we've solved that. No longer do you have to pay $300, $200, or even $100 for a set of high quality polarized sunglasses. We've broken the mold & pegged the coolness meter, without robbing your wallet of your last green backs. All us motorheads here at 509, are proud to announce the launch of our 100% polarized line of sunglasses. Made of only the highest materials and crafted to the highest standards. Every one of our sunglasses feature a polarized smoke lens and only the best styling, that you've come to expect from 509. Each pair of polarized sunglasses for sale is backed with a lifetime warranty and comes with a soft pouch and hard case. It's simple. 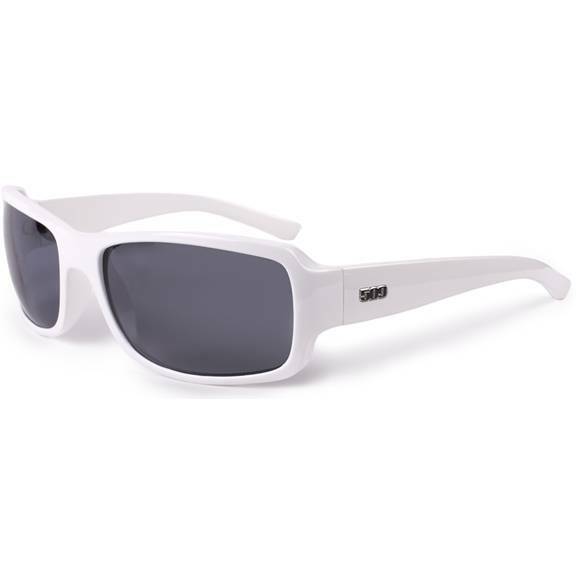 If these white framed sunglasses don't fit you perfectly, you can send them back for a full refund or swap them out for another style. Just pay the return shipping (couple bucks) and we'll even reship your new pair for free! Just like our goggles, 509 sunglasses are backed with a lifetime warranty against manufacturing defects and workmanship. If you experience a manufacturing defect, 509 will repair or replace your sunglasses at no cost. It is up to 509's discretion to determine qualifying defects. Our lifetime warranty does not cover negligence, abuse, or other damaged caused by abnormal usage. If you have a warranty claim, please contact us at support@509films.com.